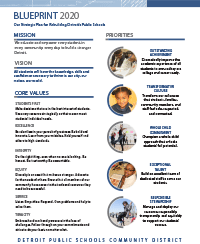 The Detroit Public Schools Community District Superintendent Nikolai P. Vitti announced the unveiling of the Board-approved new three-year strategic plan at a news conference focused on five priorities: outstanding achievement, transformative culture, whole child commitment, exceptional talent, and responsible stewardship. The plan includes the District’s new mission, vision, core values, and priorities. The Detroit Promise provides last-dollar funding for students who live in the city of Detroit and will graduate from any high school located in Detroit in 2018. The Detroit Promise provides Detroit youth a tuition-free path to earn a postsecondary credential at a number of institutions after any Pell and/or TIP funding a student receives has been applied to the tuition and mandatory fees bill. More information is available at detroitpromise.com. Students interested in applying to a DPSCD Examination High School (Cass Technical High School, Martin Luther King, Jr. Senior High School, Renaissance High School, or Southeastern High School) for the 2018-2019 school year must submit the following documentation in order to receive a testing date and login for the required placement exam: DPSCD Examination High School Application, transcript or current report card, 1 letter of reference, and student-authored formal letter of student interest. Current DPSCD students will take the placement exam at their current school. Students not currently enrolled in the district will need to attend a Saturday placement exam session. The DPSCD Examination High School placement exam results will be communicated via email and the DPSCD Parent Portal. Specific directions about the DPSCD Examination High School process are listed below. Should you have any questions, or need assistance, please contact the Office of Assessment and Accountability at (313) 576-0100.